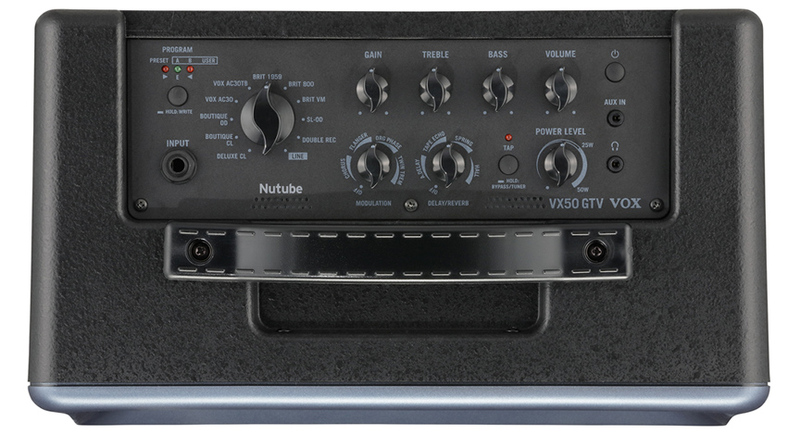 Introduced in January 2019, the VX50 GTV had a hybrid design that combined a 50 watt Class D solid-state power amp with a Nutube powered preamp featuring digital effects and amp modeling. It joined the three previously released models in the VX50 range, the VX50AG Acoustic amp, VX50KB Keyboard amp and VX50BA Bass amp. 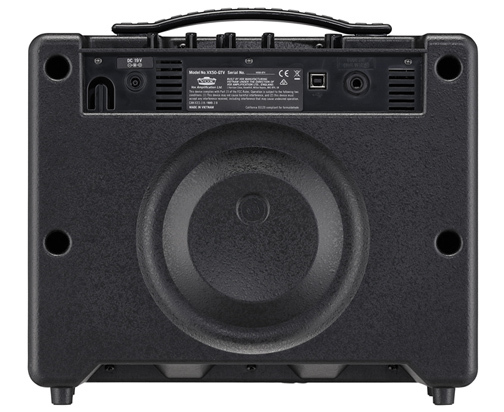 The VX50 GTV featured a lightweight but durable injection molded black ABS plastic cabinet with a metallic blue fascia, wood baffle, black "shadow diamond" grill cloth and an 8" speaker. The enclosure included a bass reflex port to enhance low end response. 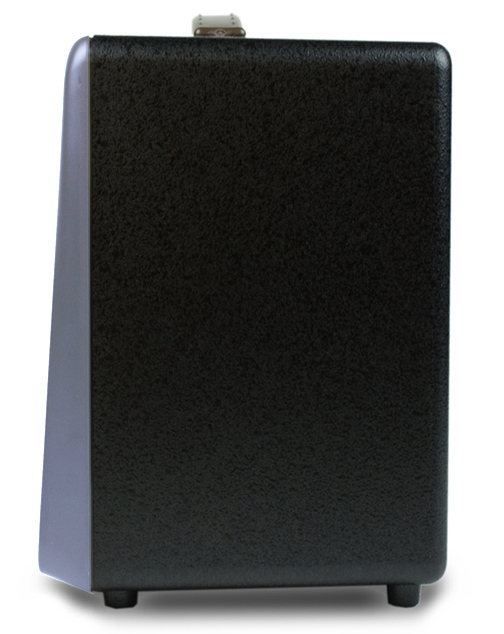 This unique cabinet design, combining plastic and wood, allowed the VX50 GTV to weigh only about 9 pounds. The preamp section of most tube guitar amplifiers will include at least one 12AX7 tube. The 12AX7 was designed as a "dual triode," meaning that it includes two separate circuits for amplification. Each of these triodes has three elements: a cathode, control grid and an anode. Amplification occurs when a flow of electrons from the cathode passes through the control grid to the anode. A filament wire located near the base of the tube heats the cathode to start this flow of electrons. Korg has been a leading manufacturer of portable keyboards since the early seventies. Most modern Korg keyboards incorporate a vacuum florescent display (or VFD) that offers a visual indication of the sound that is loaded and ready to play. Korg discovered that a vacuum florescent display could be configured as a triode, complete with cathode, control grid and anode, to create amplification. After years of research, Korg developed the dual triode Nutube 6P1 vacuum tube (seen at lower left). 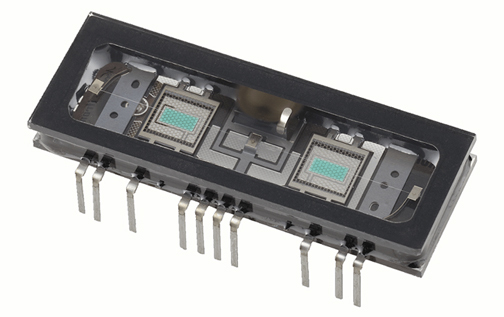 It utilized new technologies derived from vacuum florescent displays that would allow the Nutube 6P1 to perform the same functions as a traditional 12AX7 tube. The Nutube 6P1 offered a number of advantages over the 12AX7. The Nutube 6P1 is significantly smaller than a 12AX7. As it did not require a traditional filament heater, the Nutube 6P1 required a fraction of the current required to power a 12AX7. Unlike the 12AX7, the Nutube 6P1 remained relatively cool to the touch while in operation. Finally, the Nutube 6P1 offered a significantly longer service life than the 12AX7, perhaps never needing replacement. The preamp of the Vox VX50 VTX utilized a Korg Nutube 6P1. The Nutube offered the rich overtones of a traditional vacuum tube without the need for periodic replacement. The turquoise glow emanating from the Nutube 6P1 can be seen through a series of small holes located on the control panel. The VX50 GTV featured a digital amplifier modeling engine called VET, or Virtual Element Technology. VET didn't just aim to just get the "essence" of the tone of the worlds most iconic guitar amplifiers, it modeled how the electronic components and circuit designs interract in these classic amps. Ten VET amp models were included: Deluxe, Boutique Classic, Boutique Overdrive, Vox AC30, Vox AC30TB, Brit 1959, Brit 800, Brit VM, SL-OD and Double Rectifier. An eleventh position on the rotary amp model selector offered a line input with flat response suited for acoustic guitar. To further increase tonal flexibility, the "Program" button provided storage for three tonal variations of each VET amplifier model. 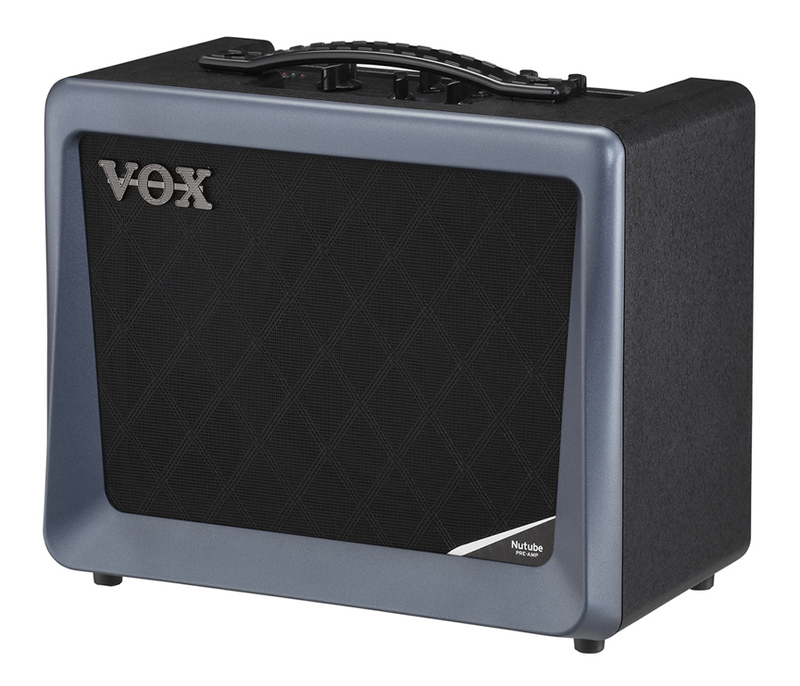 The first selection was labeled "Preset" and was designed by Vox to complement the tone of the amp model. The other presets were labeled "User A" and "User B." These presets could be adjusted and stored to personal taste. A series of three LED lamps indicated which preset was selected. 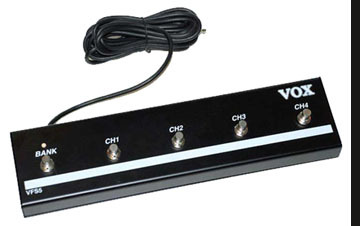 The VX50 GTV included four modulation effects: Chorus, Flanger, Org Phase and Tremolo. The "Modulation Effects" control knob was divided into four sectors. One modulation effect was assigned to each sector of the control. Rotating the "Modulation Effects" control clockwise from "Off" advanced through the four modulation effects. While the rotary control adjusted the depth of the modulation effects, the "Tap" button adjusted modulation speed. The VX50 GTV also included four delay effects: Analog Delay, Tape Delay, Spring Reverb and Hall Reverb. The "Delay/Reverb" control knob was also divided into four sectors. One delay effect was assigned to each sector of the control. Rotating the "Delay/Reverb" control clockwise from "Off" advanced through the four delay/reverb effects. Depressing the "Tap" button for several moments engaged the guitar tuner. It used the three LED lights from the Program section to indicate if a guitar string was on pitch. The VX50 GTV included a 1/8" line out/headphone jack that included a cabinet simulator. The VX50 GTV included a complementary download of the Vox JAM software application for PC or Mac. Using this software required that the amp be connected to a computer or mobile device via a USB port found on the rear control panel. Vox offers two optional foot switches for the VX50GTV. 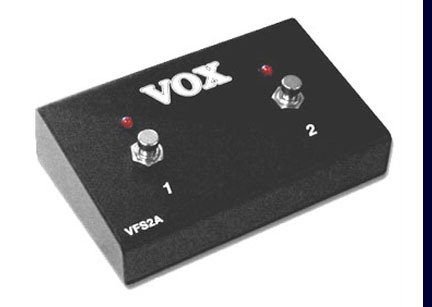 The two button VFS2A foot switch allows the remote selection of two presets. 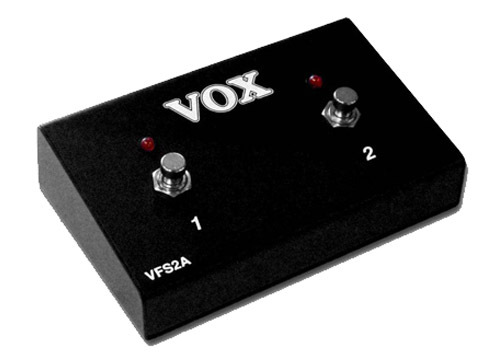 The five button Vox VFS5 foot switch expanded program selection to two banks of four programs, or a total of eight. Dimensions (W x D x H): 13.94" x 8.19" x 12.32"